Qi (life force energy) is the vehicle and expression of the beauty, emotions and passions of art. The two painters Vincent van Gogh and Jackson Pollock were masters who in their outer visions and inner torments (both died in apparent suicides) saw, and experienced Qi; then translated this vision to their art so the observer could partake in the explosion of the beauty and pain of life. However both men when in the actual act of painting transcended their personal torments and entered into a state of near ecstasy by leading and guiding the Qi through a paint brush – as with Van Gogh, or by dripping and spilling paint from a can as with Pollock. The two paintings described here are graphic depictions of Qi. They offer an experiential understanding of how Qi may manifest itself, and offer an approach to a visceral understanding of what Qi is. This painting is of the view before sunrise from Van Gogh’s window at an asylum in Saint-Rémy-de-Provence in France. To the left is a large cypress tree. The white orb directly to its right is probably Venus as the Morning Star. A crescent moon shines in the top right hand corner of the painting. It is one of the most famous paintings in the world. 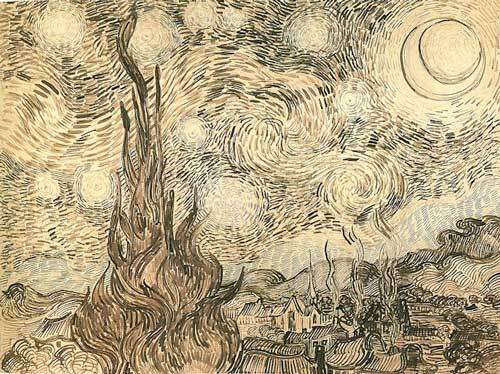 This is a reed pen drawing Van Gogh did before doing the actual painting. Here you can see the framework of the painting: flowing, circling, spiraling lines of energy. Qi moves in such swirling and spiraling lines. 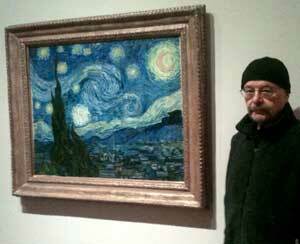 Author with the painting, March 19, 2014. This painting depicts patterns of energy which are loosely controlled by the artist's methods of pouring and dripping paint on a canvas placed on a floor. Upon viewing the actual painting (a large 7.75 by 13 feet) its seemingly explosive chaos gives way to being swept up, carried away and absorbed into an energetic "gateway into a different mindset, into a transcendent experience." 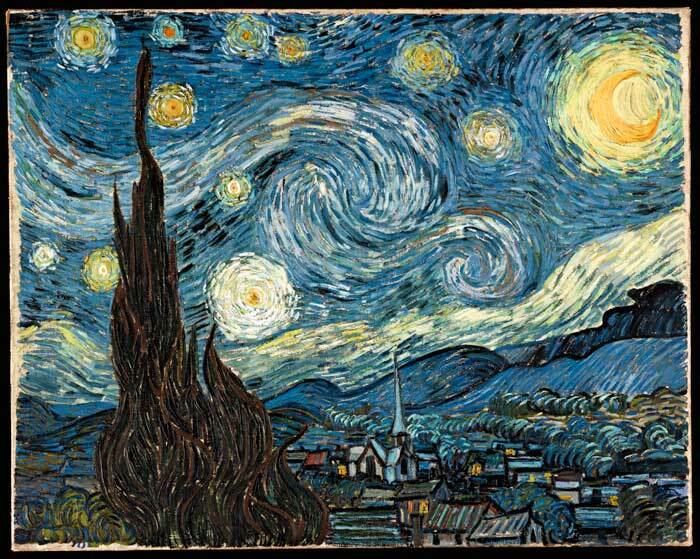 The Starry Night (1889) —Vincent van Gogh. Museum of Modern Art, New York City. Historically the first meaning of Qi was "cloud vapor." Many people (the author included) actually see Qi as such a phosphorescent presence. In the painting the mist hovering above the hills resemble this sort of perceived Qi. Traditionally the Earth is thought to be feminine yin energy and the Heavens yang masculine force. The swirling thick lines in the central part of the painting resemble an abstract yin/yang symbol. Heaven Qi is the "first force of nature spiraling down from the celestial moon, stars, and planets." Human Qi is felt with the presence of man-made buildings with their lit windows and occasional blood red roofs, and with the upward pointing church steeple. Earth Qi is most poignant in mountains. The hills, smaller trees and large cypress tree also create an experiencing of Earth Qi. The misty formations hovering above the hills and mountains—besides possibly being a vision of a singular Qi—could represent female energy or Yin rising up from the Earth. The painting is a two dimensional static entity. But when I stood by the sides of the painting looking at it an astonishing thing happened: The elements of the Heaven (Sky) Qi, the clouds, stars, moon, became three dimensional, jutting out from the canvas past the hills and village and trees. In that moment the painting became (at least for me) a singular almost mystical experience of witnessing Qi as a unified entity but also as something that filled each singular image in the painting. From a Chinese perspective reality unfolds this way: first Qi as a universal potential—in other words as an invisible non-manifest energy. It becomes kinetic —observable—in the interactions of Yin Qi and Yang Qi, usually depicted in the colors black and white. Yin and Yang then unfold into five realities; in qi work often seen as the Five Elemental Energy Phases (Wu Xing) that carry the colors of green, red, earthen yellow, white and blue. At some level—probably intuitive—Pollock recreated this Daoist cosmology: the underlying foundation of Number 10, 1952 is splashed black and ivory white paint, which are then covered with dripped red, yellow, white, and blue colors. 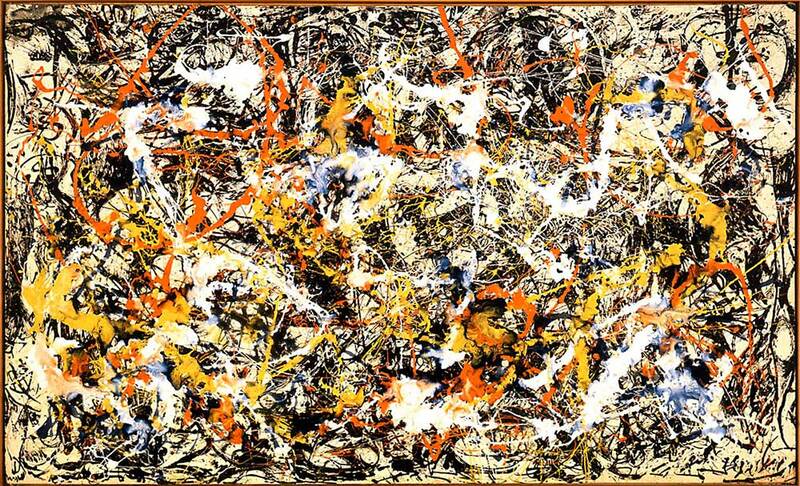 Pollock at this time (1952) was studying eastern mysticism and spoke of "Everything has a soul"…universal energy." Vincent Van Gogh or Jackson Pollock were not painting expository essays about Qi. However, each artist at some level of experiential understanding, seemed aware of Qi (or the lack of Qi) in what they saw and painted. Their work remains for us to marvel at and to enjoy, and in that pleasure experience what Qi is. ^ Steven Naifeh. Jackson Pollock: An American Saga. Potter/Crown, 1989, p. 688.